An abandoned storage unit, more often than not, is going to contain little more than some old furniture and a dusty book or two. Once in a while, though, they contain crazy things worthy of note. 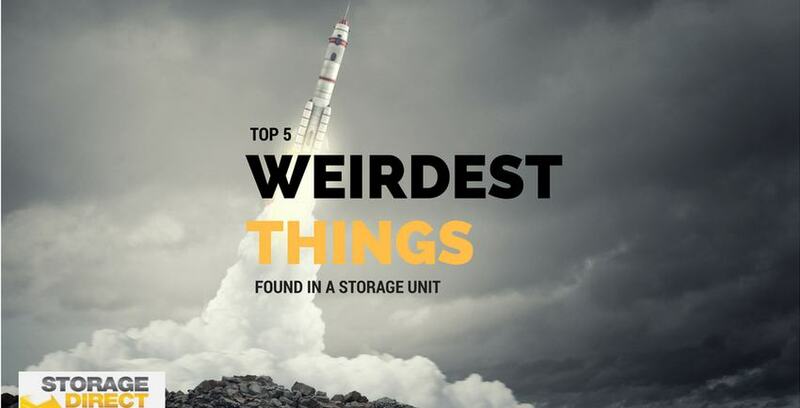 At Storage Direct, we’ve got units of all shapes and sizes – a few of which have held some interesting things during their lives – but nothing quite as nuts or as memorable as the items listed below. According to the Tampa Bay Times, during a storage unit auction in Clearwater, Florida in 2012, someone found something wholly unexpected: a coffin. Inside the coffin was someone’s grandmother, left embalmed in her powder blue coffin, tucked in the back of the storage unit for over 15 years. What a way to go. Five years ago a storage unit that had once belonged to legendary songstress and diva extraordinaire Aretha Franklin was auctioned off after the performer stopped paying the unit fees because she was no longer invested in any of it’s contents. Ms. Franklin herself was quoted saying she was curious what was inside, as she had forgotten it’s contents many years previous. Turns out there were bags and bags of her old beautiful costumes and other performing memorabilia that ended up being auctioned off individually by the purchasing party. The very first Superman comic. When a man got in touch with a collectible expert Mark Baleo in 2011, telling him that he had found a copy of Action Comics no. 1 in a storage unit he purchased, the both of them were awestruck by the overwhelming luck. The buyers luck didn’t last, however, because despite the comic being worth over one million dollars, it turns out it belonged to famous actor Nicholas Cage and had been reported stolen from his home years past, where it was rightfully returned. Bummer. The canoe from the movie Deliverance. Burt Reynolds has always been a notorious packrat, and over the course of the years has let many of his filled storage units go up for auction. One of those units contained the canoe from the movie Deliverance, something he had said he wanted nowhere near him because of the dark undertones of the film. In a cool twist of fate, a number of fans banded together to buy the contents of most of his units and repurpose them for the Burt Reynolds and Friends Museum. Filmed live on television during an episode of Spike TV’s Auction Hunters, the show’s hosts opened up a storage unit that contained an actual NASA countdown clock and rocket. They didn’t make a ton of money on the find, but can you really put a price on finding an actual rocket? Crazy things are found in units all the time, but the true magic of storage units is how useful they can be when you really need them. Contact us at Storage Direct today to see how our wide variety of unit sizes and styles can help you clear a little clutter.